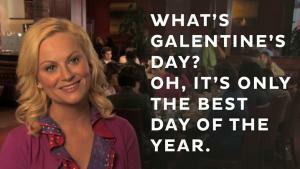 Ladies, grab your girlfriends and celebrate your awesomeness on Galentine’s Day. In the immortal words of Leslie Knope from Parks and Recreation, “It’s only the best day of the year.” Check out these fun suggestions. Start the day in Camp Hill with breakfast and a specialty drink at Cornerstone Coffeehouse, a local favorite. Their extensive menu includes breakfast burritos, homemade baked oatmeal, homemade quiche, croissant sandwiches, and breakfast pastries. Their drinks are just as decadent with espressos, lattes, cappuccinos, fresh fruit smoothies, and kombucha on draft. If you have more time, end your day in Camp Hill with an indulgent spa treatment. Relax in the Dead Sea salt room or the infrared sauna at Hygea Wellness; let your cares melt away with flotation therapy at Dissolve Float Spa; or pamper yourself with a luxurious and restorative skin care treatment at Beyond Beauty Skin Therapy. After your skin is glowing head to Carmina Christina, a makeup boutique selling beauty and skincare products, including the owner’s own line of cosmetics. Follow these words of wisdom from Leslie Knope: “We need to remember what’s important in life: friends, waffles, work. Or waffles, friends, work. Doesn’t matter, but work is third.” So start your day with friends in Carlisle and order the waffles at Fay’s Country Kitchen, where you can enjoy tasty homestyle cooking and generous portions. (TIP: Fay’s only accepts cash.) 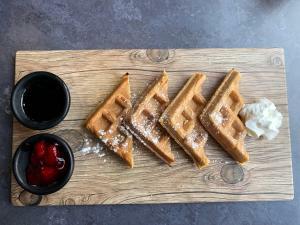 Or, try the waffle flight at Grand Illusion Hard Cider during Sunday brunch. Shopaholics will find trendy clothing and accessories at nearby downtown Carlisle stores like the clothesVine and Boutique on Pomfret. For a vintage look, check out Miss Ruth’s Time Bomb and Marjorie’s Gems. If you’re feeling funky, stop by Pat Craig Studios to see their jewelry and accessories. Carlisle is also home to several galleries featuring beautiful handcrafted items across all types of mediums. The Carlisle Arts Learning Center, The Garden Gallery, Nancy Stamm’s Galleria, and American Artisan Gallery are go-to spots to view and purchase these creations. Foodies will love The Kitchen Shoppe, a gourmet superstore with more than 20,000 kitchen items and over 200 cooking classes. Larsen Meadworks and Brittle Bark are located next to each other in Mechanicsburg. Pick up some chocolate at Brittle Bark and then savor the flavors with some distinctive honey wine at Larsen Meadworks. In the picturesque town of Boiling Springs, you will find the best in American craftsmanship and quality at Village Artisans Gallery – including blown glass, pottery, woodwork, metalwork, and handwoven apparel. End the day at The Allenberry Resort where you can savor local food and seasonal farm-to-table ingredients at The Barn or enjoy a theatrical performance at The Playhouse. If it’s too hard to coordinate a day trip with your friends, you can sit back, relax, and ride in style along our Cumberland Valley Beer Trail with a customized transportation package from Unique Limousine or Premiere #1 Limousine Service. Tap, tour and try a pint as you travel to some of our more than 25 beer trail locations from Chambersburg to Harrisburg and locations in between. What better way to spend the day with friends than craft beer (and wine and spirits and cider) and great local food!